Wonders, William C.. "Northwest Territories". The Canadian Encyclopedia, 21 January 2019, Historica Canada. https://www.thecanadianencyclopedia.ca/en/article/northwest-territories. Accessed 19 April 2019. The Northwest Territories lie northwest of central Canada, bordered to the east by Nunavut, to the west by the Yukon and to the south by the northeastern corner of British Columbia, as well as the entire northern borders of Alberta and Saskatchewan. The name was originally applied to the territory acquired in 1870 from the Hudson's Bay Company and Great Britain: Rupert’s Land and the North-Western Territory. In 1880 Great Britain also transferred to Canada the arctic islands, north of the mainland, thereby adding to the territories. The acquisition of the NWT was a major component of the Canadian government’s desire, led by Sir John A. MacDonald, to construct a British nation in North America and to guard against the potential incursion of American settlers. The NWT includes three main regions: the Arctic Archipelago to the north, the arctic mainland and the Mackenzie Valley area. The arctic mainland, sometimes referred to as the Barren Lands, lies northeast of the treeline, and the Mackenzie Valley area to the west. The Arctic Archipelago — the world’s second largest high arctic land area — consists of 94 major islands, some of which are included in the NWT. Banks Island, the northeastern part of Victoria Island, the western part of Melville Island and the Parry Islands	lie within the territories' border. Ice never disappears from the northwestern-most islands and covers all the surrounding seas for much of the year, severely limiting navigation. The southeast sector of the Archipelago is not as cold, however, because of its proximity to the open waters of the North Atlantic, and with its higher elevation, it receives higher precipitation than elsewhere in the Arctic, which overall is among the driest areas of Canada. The Archipelago differs from the other two regions of the NWT in that summers remain cool, averaging only 10°C in July over most of the area because of the surrounding cold waters. The great contrast between the long days of summer and the short (even nonexistent) days of winter reflects the high latitude. Severe climate and permafrost result in very poor soil development. Vegetation is tundra, varying from low bush to grass, but even this limited vegetation is lacking in certain areas. The territories' first national park, Aulavik, was established in the Archipelago on Banks Island in 1992. The Canadian Shield makes up the arctic mainland. Canada's oldest rocks (3.96 billion years) were found east of Great Bear Lake. Pleistocene ice sheets polished its surface, stripping away surface material down to the bedrock. 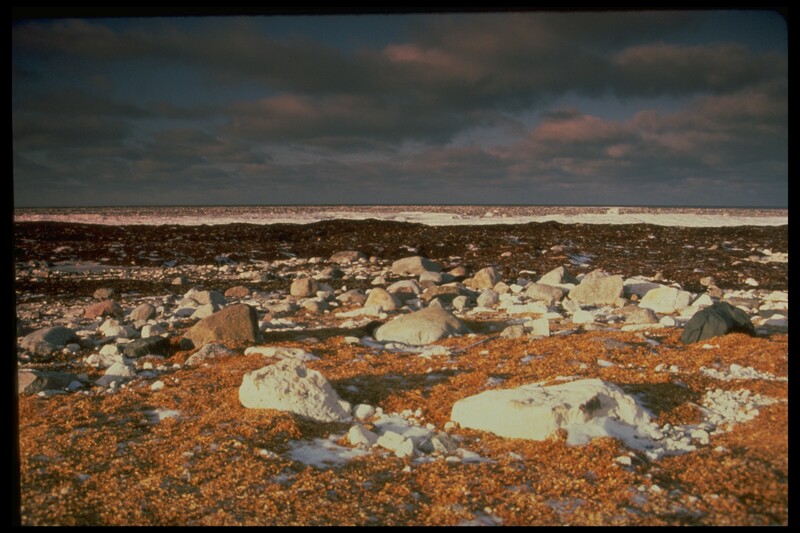 In places boulders, sands and gravels remain from the melting ice. Overall it is a gently undulating rocky surface of low elevation, with a bewildering maze of rivers and irregular lakes. Tundra in the Southern Arctic Region of the NWT. Image: \u00a9 Tim Fitzharris. As in the Archipelago, true soil is generally absent. Vegetation is the tundra type, usually including considerable shrubs. In sheltered places, as along inland water courses, stunted trees may extend out from the forested lands on the south and west. Climatically, as well as in location, the arctic mainland lies between the Arctic Archipelago and the Mackenzie Valley, with more severe winter temperatures and higher summer temperatures than the former because of its continental location. Baker Lake, for example, west of Hudson Bay, has an average daily high of -27°C in January and 16°C July, with a mean total precipitation of 268 mm. Geologically this area ranges from the Canadian Shield on its eastern margin through younger Paleozoic and Mesozoic sedimentary formations in sequence to the west. Great Bear Lake (31,328 km2) and Great Slave Lake (28,568 km2) lie along the contact line of the Shield, which here often exceeds 300 m of relief. This vegetation division corresponds to a cultural division of the area’s Aboriginal peoples, with the Inuit occupying the Arctic and the Dene, the Subarctic. The greater economic development and larger population of the subarctic Mackenzie Valley also sets it apart from the arctic mainland. Much of the Mackenzie Valley area consists of the narrowing northward extent of the level continental Interior Plains, with occasional level-bedded hill areas a few hundred metres above the general surface. In the west it rises abruptly into the mountainous terrain of the rugged Cordillera region with peaks of over 2,700 m. The area is integrated by the Mackenzie River and its tributaries, whose total drainage area (1.8 million km2) and system length (4,241 km) are the largest and longest in Canada. Only the northernmost part of the area falls within the continuous permafrost zone, unlike the other two regions of the NWT. Almost the entire territory falls within the discontinuous zone where permafrost is widespread if not universal. Heart Lake, NWT (courtesy Provincial Museum of Alberta). 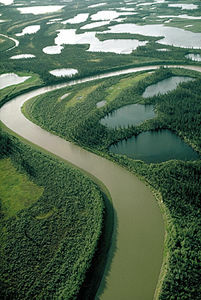 Aerial view of Mackenzie River (courtesy Canadian Tourism Commission & Ocean Images). 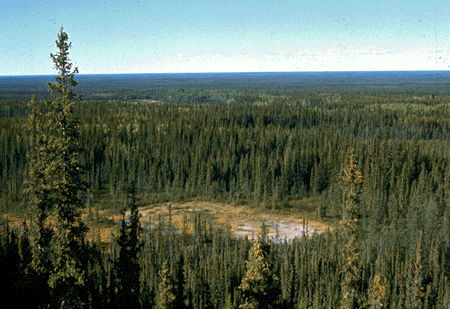 The upper Mackenzie Valley lies within the boreal forest transitional zone, where spruce and larch are common. The lower Mackenzie Valley is within the Northern boreal woodland area, which has a great number of tree species including white birch, jack pine, balsam fir and trembling aspen. Extensive areas of poor drainage occur, especially on the plains, as a result of permafrost and continental glaciation. These result in string bogs and muskeg. Temperature ranges are greater in the Mackenzie Valley than in the other two regions. At Fort Good Hope, for example, the average daily high is -25°C in January and 21°C in July. 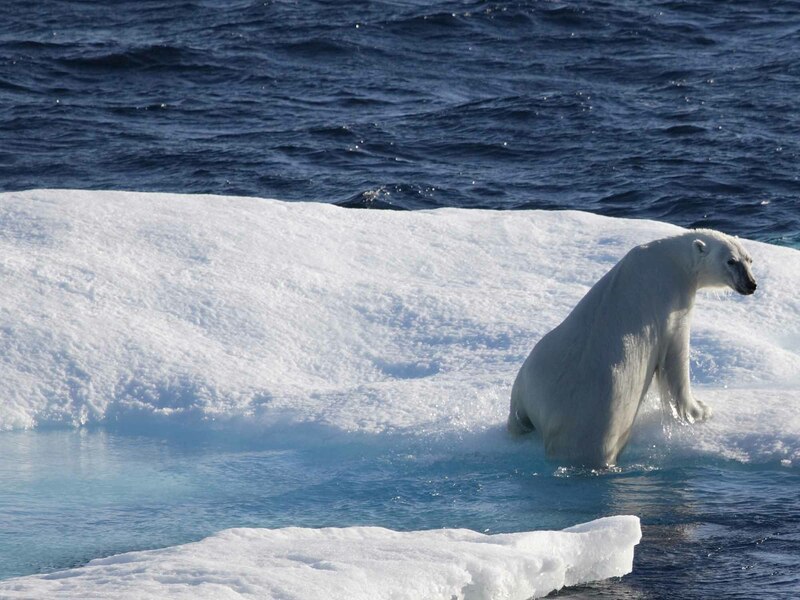 Precipitation, including snowfall, is significantly higher than for most of the Arctic. Wood Buffalo National Park, straddling the Alberta boundary, is Canada's largest national park (44,802 km2). It was established in 1922 to protect the only herd of wood bison in their wild state, and also contains several thousand plains bison and the summer nesting grounds of the nearly extinct whooping crane. A northward extension of the fur trade led to the first non-Aboriginal presence in the NWT in the late 18th and early 19th centuries as posts were established down the Mackenzie Valley. Missions arrived in the latter part of the 19th century, and the RCMP and other representatives of the federal government in the 20th century. However, there had been a police presence in the Northwest Territories for much longer, including the founding of the North West Mounted Police in 1873 to combat the perceived lawlessness of the region. The overall policy of the government by its increasing presence in the NWT was to “tame” this frontier civilization, including integrating the Aboriginal population. Mineral and transportation developments in the 1930s marked the beginning of a more significant non-Aboriginal influx. In the arctic regions, the remoteness made access more difficult, and fur trade posts were not established there until the 20th century. Permanent settlements were not established in the Queen Elizabeth Islands until after the First World War. The population of the territory in 2016 was 41,786, compared to 41,462 in 2011. Because of the small total population, external policy and economic conditions have significant impact on NWT’s growth rate. Growth has been erratic since 1966, reflecting the administrative transfer from Ottawa to Yellowknife, the ceding of territory for the creation of Nunavut in 1999 and the fluctuating interest in mineral resource development. The birth rate remains one of the highest in Canada, however (about 1.79 children per woman), which creates pressure for employment. The most populous of the small urban centres in the Northwest Territories are located in the Mackenzie Valley area, with Yellowknife, the capital, being the largest city. 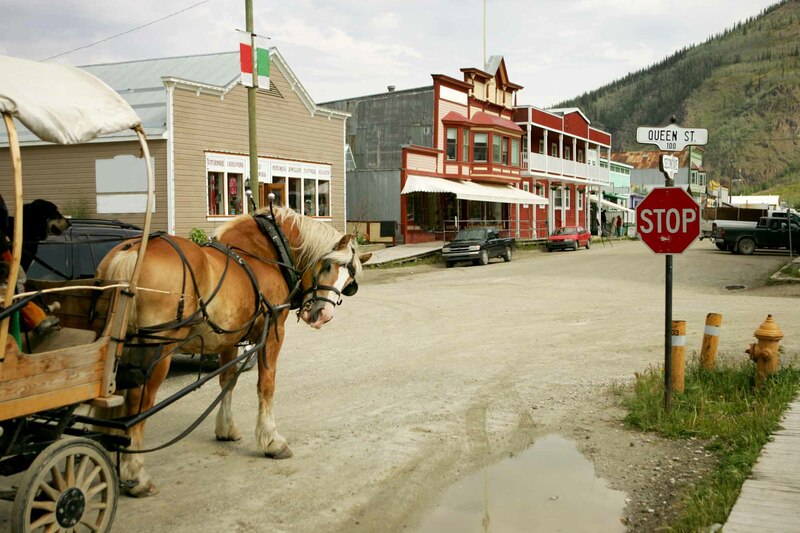 It began as a gold mining centre and became the territorial capital in 1967. While most of the settlements in the NWT are significantly smaller than Yellowknife, they are important for various reasons. Fort Smith, for example, was the major administrative centre prior to Yellowknife becoming the capital, and remains central to the region. Hay River is a transportation and fishing centre. Behchokò is the largest Dene community in the NWT and an administrative hub for the Dogrib people; while Inuvik is the major administrative and transportation centre for the western Arctic. Fort Simpson, once the centre of the fur trade, is located at the confluence of the Liard and Mackenzie rivers. In 2016, the sectors employing the most people were public administration, health care and social assistance, and retail. At 10.6 per cent, the unemployment rate was among the highest in the country. 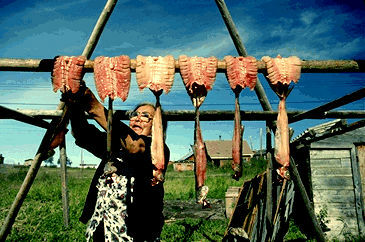 Aboriginal people represent approximately half of the population of the NWT. There are three main communities making up the larger Aboriginal population: the Dene, Inuit/Inuvialuit and Métis. Within the Dene community are smaller tribal groupings, namely the Chipewyan, Dogrib, Yellowknives, South Slavey, North Slavey, Gwich'in and Sahtu Dene. There are 11 official languages spoken in the Northwest Territories: Chipewyan, Cree, English, French, Gwich’in, Inuinnaqtun, Inuktitut, Inuvialuktun, North Slavey, South Slavey and Tlicho. Before Europeans arrived and began to engage in trade with the Aboriginal population of what is now known as the NWT, the area was populated by small groups of Aboriginal peoples (such as Inuit and Dene). These groups — the Inuit often being nomadic and located in far northern areas — had lived for generations in the harsh climatic conditions of the region, supporting themselves through hunting and fishing. These traditional lifestyles were altered with the arrival of European settlers and traders, but Aboriginal peoples never disappeared from the territory. The first known European explorers to visit today's NWT were the Vikings, who sailed to the Eastern Arctic from their Greenland settlements (ca. 1000 CE). In 1576 Martin Frobisher	was the first of a series of European explorers seeking the Northwest Passage, but, by the early 16th century, the severe ice conditions and the limitations of the ships checked much farther advance. In 1770–71 Samuel Hearne of the Hudson Bay Company made a remarkable overland trip from Churchill through the arctic mainland to the Coppermine River. Though the company used the Hudson Bay route, its interests were farther inland on the continent. Alexander MacKenzie of the North West Company pushed north from Fort Chipewyan	on Lake Athabasca in 1789 to follow what became known as the Mackenzie River to its mouth. Fur trade posts were soon established along his route and in tributary areas, and were subsequently taken over by the Hudson’s Bay Company. Later exploration in the Arctic Archipelago focused on a renewed search for a Northwest Passage in the first part of the 19th century, and on attempts to reach the geographic North Pole in the latter part, a journey finally completed by the American R.E. Peary in 1909. The disappearance of Sir John Franklin's 1845 expedition led to the addition of much map information by the search expeditions and included the traverse of the elusive passage in 1853 by Sir Robert McClure (though the first traverse by ship was in 1903–04 by Roald Amundsen). Later British and American expeditions proceeding up the eastern coast of Ellesmere Island explored the eastern Queen Elizabeth Islands. The Norwegian explorer Otto Sverdrup	discovered most of the remaining islands to the northwest at the turn of the 20th century, with Vilhjalmur Stefansson completing discoveries between 1913 and 1918. The federal presence was represented in these small settlements after the turn of the century by the RCMP, Royal Canadian Corps of Signals radio stations and by other agencies. Strategic water transportation sites, such as Fort Smith and Tuktoyaktuk, provided other attractions for limited settlement. Because of its easier accessibility and more varied resources, more incomers trickled into the Mackenzie Valley than the Arctic. In 1921 the federal government also signed its last numbered treaty, Treaty 11, with the Aboriginal peoples north of Great Slave Lake. Treaty 11 was spurred by the enthusiasm caused by the discovery of oil at Fort Norman in 1920. The government sent a treaty commission to the Lower Mackenzie River valley to open the territory for easier, further resource exploration. As with the other numbered treaties, Treaty 11 guaranteed certain rights, such as Aboriginal hunting and trapping rights, yet the federal government often ignored these rights and interpreted them as being subject to government regulation. Beginning in the 1930s mineral exploration aided by bush pilots and their improved aircraft, along with more European hunters, resulted in a significant influx of newcomers, even into the Arctic mainland. The interwar years saw the rise of disease and the decline of traditional ways of life among the Aboriginal populations as the new mining industry brought settlers to the region. The availability of hunting game was disrupted, coinciding with a decline in federal funding to the NWT during the Great Depression. In recent decades major change and development in the NWT have resulted from international and national political events, widespread social change, large-scale resource demands and the availability of improved technology. As early as the Second World War, the impact of international hostilities was felt in Mackenzie Valley settlements through the Canol Pipeline and in the southern part of the Eastern Arctic through the North East Staging Route airports. The Cold War resulted in DEW line radar stations (see Early Warning Radar) being built across the Arctic and contributed to the introduction of the first permanent settlements in the Queen Elizabeth Islands as part of the Joint Arctic Weather Stations project (see High Arctic Weather Stations). Following the Second World War, economic conditions in the NWT began to deteriorate as fur prices declined and the Hudson’s Bay Company began closing posts. Inuit communities began living around military stations for security and access to resources. The conditions were miserable. The government’s response was to relocate the Inuit to best suit their administrative needs, and to facilitate the delivery of services. This process significantly disrupted kinship bonds and furthered the decline of traditional game hunting. In some cases, the Inuit who were chosen to be relocated were deceived by the government with regard to families being kept intact and where they were going to be resettled. In recent years, the Inuit in this area have begun to demand recognition of their unique role in the protection of Canadian sovereignty. In 1953, the federal government assumed increased responsibility for the territory with the creation of the Department of Northern Affairs and National Resources (now the Ministry of Aboriginal Affairs and Northern Development). Major improvements were made in health services, housing, education facilities and communications to bring them more in line with those of southern Canada. More recently much of this responsibility has been delegated to the territorial government. Government services are now more numerous throughout northern settlements and occasionally provide the greatest source of local employment. As a result, most northern residents now live in permanent settlements for most of the year. The demand for minerals and fuels, along with improvements in mining and transportation technology, has made northern resources economically attractive and resource development provides employment. On the other hand, resource development promotes an unpredictable economy and further threatens the Aboriginal communities’ traditional way of life. Primary resource extraction is the foundation of the NWT economy. Furs, the original base, are now of much less importance. Commercial whaling disappeared early in the 20th century. From the 1930s, minerals have become the most important economic base for the NWT, with all other economic activities except the service industry far behind. Agriculture is of negligible significance in the NWT. In the years after the First World War, there were small attempts at agriculture such as mission and hospital gardens as well as teaching Aboriginal children farming techniques believed to be superior to their traditional way of life. These efforts, combined with the desire to provide land for returning soldiers, all encouraged the Canadian government to expand further north. Though brief these efforts did have long-term effects on the northern environment through the clearing of land and introduction of new grasses and plants. Ultimately, however, small markets, summer drought and limited good soils create serious obstacles to agriculture in the NWT. Improved transportation often makes it cheaper to bring in agricultural products from the south. Today, only a few market gardens operate in the Hay River valley. Mining is an integral part of the NWT economy. Over the years, the focus of mining in the region has moved from base and precious metals (such as uranium, gold, lead and zinc) to primarily diamonds. For example, diamonds at Lac de Gras, 300 km north of Yellowknife, attracted much attention in the 1990s. The discovery of the first Kimberlite pipe — a type of cone-shaped rock often containing diamonds — in 1990 resulted in one of the world's largest rushes into the area the following year. There are four mines currently operating in the NWT, three of which produce diamonds and one that produces tungsten. The total value of mineral production in the NWT grew to over $2 billion in 2010 from about $6.8 million in 2000, a nearly 200 per cent increase. Two of the diamond-producing mines opened during this 10-year period, accounting in large part for the increase in production value. Mining employs about 3,000 people, or about 14 per cent of the work force of the territories, and provides significant employment in related service activities such as mining exploration. Heating is a major cost for northerners, given the long, severe winters and the transportation costs. Energy needs for most settlements are provided by fuel oil and thermal power generation. In most of the territory hydro power is nonexistent. The potential hydropower resources of the NWT has been estimated at about 2,473 megawatts (MW), most of which is within the Mackenzie Valley area. (By comparison, the installed capacity of hydropower operations in Québec, one the largest producers of hydropower in Canada, was 35,829 MW in 2012.) The series of rapids on the Slave River near the Alberta boundary has attracted attention for possible hydroelectric power generation, but such a project would have serious repercussions for wildlife and wildlife habitat. Three hydro plants are currently in operation: the Snare Hydro System, the Bluefish Hydro Facility and Taltson Hydro. Electricity in the region is provided by three companies: Northwest Territories Power Corporation (NTPC), Northland Utilities Enterprises Ltd. (NUL) and Imperial Oil Ltd., which sells natural gas to NTPC for distribution in Norman Wells, an oil field in the NWT. Natural gas is produced in three locations: Norman Wells, Inuvik (Ikhil) and Cameron Hills, while oil is produced in Norman Wells and Cameron Hills. There is an ongoing search for additional sources of oil and natural gas in the NWT. In the 1970s, many expressed concern for environmental disruption caused by pipeline projects in the Mackenzie Valley and the Arctic. The MacKenzie Valley Pipeline	Inquiry resulted in the project’s delay until Aboriginal land claims and environmental issues were resolved. Similarly, in 1995, offshore exploration resumed following the lifting of a 25-year right issuance moratorium, put in place pending the resolution of land claims. Land claims remain an important issue in the face of ongoing resource development. The greatest single natural resource of the region for Aboriginal peoples has been the migratory barren land caribou, which swarmed in enormous herds to summer in this region. In the 20th century, caribou numbers fluctuated dramatically because of changes in hunting pressure and wolf abundance. Declines had serious repercussions for local residents here, resulting in the movement of the Caribou Inuit	of the Ennadai Lake area to communities on the west coast of Hudson Bay in Nunavut. 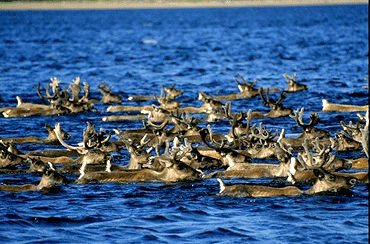 By 1985, caribou numbers were again large and most herds were increasing. 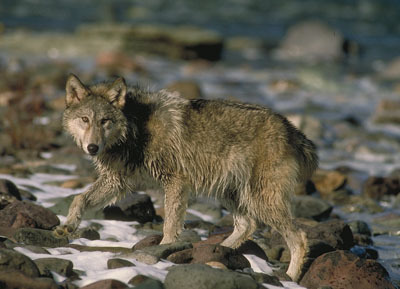 Wolves are shy, usually nocturnal and elusive (Corel Professional Photos). Factors governing timing, routes taken and reasons for migratory movements are among the great mysteries of science (Corel Professional Photos). 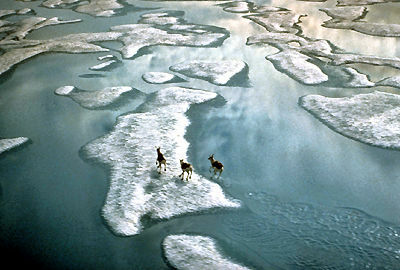 Three caribou crossing Arctic ice flows (courtesy Canadian Wildlife Service). 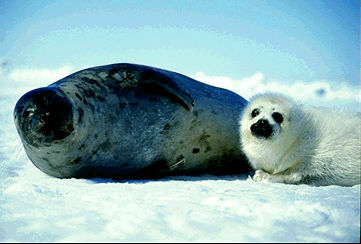 Harp seals live in the North Atlantic (Corel Professional Photos). Many of the people living in smaller communities continue to earn at least part of their living by hunting, trapping and fishing. In 2008, 39 per cent of people over the age of 15 hunted or fished in the NWT, including 45 per cent of the Aboriginal population. Six per cent participated in trapping. In addition to the fur value obtained from hunting ($830,900 in 2009), meat is a major item in the local diet. Since 1974 the territorial government assists those wishing to make a living off the land through various harvest assistance programs. Fish abound in the rivers and lakes of the NWT, and include several species of whitefish (Corel Professional Photos). The commercial fishery operates primarily out of Great Slave Lake. Whitefish is the most important catch, though pickerel and lake trout are also harvested. 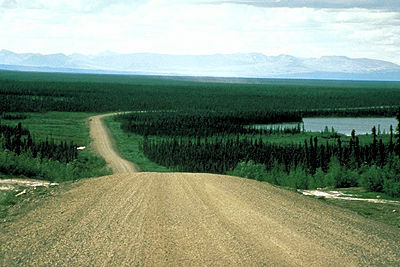 The highway runs north from Grimshaw, Alberta, to Wrigley, NWT, on the Mackenzie River (courtesy Government of the NWT). Tourism provides increasing economic benefits to the NWT, with visitors arriving by road via the Mackenzie Highway system and the Dempster Highway	in the west. Fly-in sport fishing lodges and wilderness camps are served out of Yellowknife and Fort Smith among others. The five national parks in the NWT — Aulavik, Nááts’ihch’oh, Nahanni, Tuktut Nogait	and Wood Buffalo — attract visitors despite their distance from southern Canada. Both Nahanni and Wood Buffalo are UNESCO World Heritage sites. Inuit prints and sculpture have established an international reputation and are a major source of employment. In 2008, about nine per cent of the population over the age of 15 of the NWT produced arts and crafts, including large percentages of the population of the small Aboriginal communities of Kakisa and Trout River (about 40 per cent and 48 per cent, respectively). Transportation in the NWT must cope with enormous distances, severe climatic conditions and the small, scattered population. It is remarkable that the NWT is so well-served, and the high costs can be appreciated. Commercial water transportation still operates during the summer on the Mackenzie. A modern diesel tug and barge fleet is based at Hay River, with a secondary base at the mouth of the Mackenzie at Tuktoyaktuk, the only reliably sheltered harbour on the shallow western coast. The coastal communities from Tuktoyaktuk eastwards as far as the Boothia Peninsula are served by tug and dual-purpose barge, though often the short ice-free season may restrict such service to a single call. Eastern Arctic communities are served by vessels operating out of Churchill, Montréal and Halifax, with regular annual visits as far north as Resolute but including some icebreaker escorted trips to Winter Harbour on Melville Peninsula. Since the Second World War a limited road network has been extended northwards into the Mackenzie Valley. Highways are mainly all-weather gravel roads and include several important river ferry links. The Mackenzie and Yellowknife highways link Hay River and Yellowknife to the road system of northwestern Alberta. Extensions from Hay River tie in Fort Resolution and Fort Smith. This extension is the only road access to Wood Buffalo National Park. A northward extension down the Mackenzie Valley ends at Wrigley, north of Fort Simpson. The Liard Highway, opened in 1984, ties Fort Simpson to Fort Liard and to the Alaska Highway. Inuvik and other Mackenzie Delta communities are now linked to Dawson, YT, by the Dempster Highway, making it almost possible to reach the shores of the Arctic Ocean by road. The Deh Cho Bridge, across the Mackenzie River near Fort Providence, opened on 30 November 2012, and is designed to lower the reliance of the surrounding areas, especially the North Slave Region, on ferries. The bridge will also hopefully allow for year-round commercial activities as opposed to the strictly seasonal trends of previous years. Winter roads exist seasonally over frozen lakes to many isolated communities and mines. Ice crossings have to be reconstructed annually and are only operational for about three to four months per year. The former Great Slave Lake Railway, now a branch of CN's Peace River Division, extends 696 km north from Grimshaw, AB to Hay River and is the only railway in the NWT. The railway also led to Hay River's development as the major river transportation centre because of its transhipment advantages, and displaced the earlier all-water Slave River route via Fort McMurray, AB. Aircraft often are the only practical method of transportation in the NWT, particularly in the Arctic. Airfields serve most NWT communities with populations over 100. Regularly scheduled airline service is provided from southern Canadian cities into the larger communities as far north as Resolute. From 1905, when the areas which became Alberta and Saskatchewan were granted provincial status and subsequently ceded from the NWT, until after the Second World War, the government of the NWT was carried on by an appointed commissioner and council, composed entirely of senior civil servants based in Ottawa. Beginning in 1951, elected members were gradually added to the previously all-appointed council until it became a fully elected body in 1974. In the time leading up to this change, the commissioner was a deputy minister in the federal department in charge of the administration of the Yukon Territory and the NWT in addition to other major responsibilities. In 1966, the federal government created federal electoral constituencies in parts of the Northwest Territories. In 1967 the seat of territorial government was moved to Yellowknife and the commissioner relocated there with the nucleus of what has become a territorial public service. Today, the federal Northwest Territories Act contains a written constitution and defines the powers of the territorial government. There are no political parties in the territory. The territorial assembly consists of 19 members, elected by people in the constituencies. Following an election, members choose from amongst themselves one person to serve as premier and another as speaker. Though no longer the leader of the government, the commissioner remains as the federal government’s representative in the NWT, appointed by the minister of Indian Affairs and Northern Development and acting as chief executive officer. The commissioner role is akin to that of a provincial lieutenant governor. While the Legislative Assembly of the NWT acts, for the most part, as a provincial legislature would, it does not have the same level of control. Only federal government, for example, can amend the NWT Act. The NWT also relies heavily on federal transfers. In 2012–13, for example, federal transfers accounted for 73 per cent of the territorial government’s revenue, second only to Nunavut (82 per cent) and similar to the Yukon (72 per cent). For comparison, during the same year, federal transfers accounted for 34 per cent of PEI's revenue, making it the province relying the most on the federal government, but still far less dependent than the territories. The discussion around separating what is now Nunavut from the NWT began as early as the 1950s, and stemmed from a desire on the part of the people of Nunavut — who are primarily Inuit — to have a territory and a government of their own. Finally, in 1981, the territorial government held a plebiscite and the majority voted in favour of dividing the NWT. The separation — and creation of Nunavut — wasn’t finalized until 1999. Land claim and self-government agreements have always been major issues for the territorial government. To date, three land claim agreements have been signed: the Inuvialuit Final Agreement (1984), the Gwich'in Comprehensive Land Claim Agreement (1992), and the Sahtu Dene and Métis Comprehensive Land Claim (1993). In addition, one combined land claim and self-government treaty has been signed (the Tłįchǫ Agreement, 2003) as well as one land entitlement: the Salt River First Nation Treaty Settlement Agreement (2002). See Premiers Table; ​Commissioners Table. The territorial judiciary comprises a Court of Appeal consisting of all the justices of appeal from Alberta, one from Saskatchewan and the four NWT Supreme Court justices. The Territorial Court has four resident judges (three in Yellowknife, one in Hay River and one in Inuvik) and 52justices of the peace living in communities throughout the territory. Judges and justices of the peace are appointed by the commissioner on the advice of the Judicial Appointments Advisory Committee of the NWT. The four judges of the Supreme Court of the NWT are ex officio judges in the Yukon Territory, and vice versa. There are deputy judges of the Supreme Court who serve where and when needed. Court sessions are held in Yellowknife and on regular court circuits throughout the territories. The NWT elects one member to the Canadian Parliament (the seat for the Western Arctic riding is currently held by Dennis Bevington, NDP; he has held the seat since the 2006 federal election), and also has one representative in the Senate (the Senate representative is Nick G. Sibbeston, Liberal, appointed by Jean Chretien in 1999). For administrative purposes the NWT is divided into five regions. Decentralization and devolution recently have increased the importance of these areas. In fact, an early demand for decentralization of government and the recognizing of local Aboriginal identities in the 1980s would pave the way for the eventual creation of Nunavut in 1999.. Despite the success of some of these demands, the development of municipal government to provide local decision-making has been hampered by the small size of many of these communities, their remoteness and their limited local economic resources. There is one city in the NWT, Yellowknife, along with one village, Fort Simpson. In addition, there are four towns, four community governments, three charter communities and 11 hamlets. Until Northern Health Services was established by the federal government in 1954, health services in the territory were provided principally by church agencies. The territorial government assumed full control of health services in 1988. Modern hospitals are located in Yellowknife, Hay River, Fort Smith and Inuvik, with lesser facilities, including some 50 nursing stations, scattered over the territory. Dental care is available in Yellowknife, Hay River, Inuvik and Fort Smith, and from government-employed full-time dentists and dental therapists located throughout the NWT. Until the end of the Second World War, education was provided mainly by church missions, with students usually housed in nearby residences in a few larger centres. Following the Second World War, education in the NWT was reformed, creating a system of state schools. Beginning in 1959, a massive education development program was initiated by the federal government and was transferred to the territorial government in 1969. While the policy of educating all children, no matter how remote their location, was implemented with good intentions, it resulted in many children being taken from their traditional land and placed in large, centralized schools. For many years no effort was made to teach students either their languages or customs as it was assumed that integration into the wider Canadian society would create a more independent populace. The establishment of divisional boards of education increased local control of education in the NWT. The Baffin region was the first to form a divisional board in 1985, and by 1991 divisional boards of education were established in all regions except Yellowknife. As of 2013, these divisional boards are the Beaufort-Delta Education Council, the Sahtu Divisional Education Council, the Dehcho Divisional Education Council and the South Slave Divisional Education Council. The granting of limited self-government to the Tłįchǫ placed education for this tribe under the Community Services Board. One member of each locally-elected community education council is selected to serve on the region's divisional board. Yellowknife is represented by a public and a Catholic board of education which were founded in 1933 and 1951 respectively. Members of these boards are elected in municipal elections. The boards and divisional boards have authority for the delivery of education from kindergarten to grade 12. Divisional boards of education receive their funding from the territorial government. The two Yellowknife boards receive the majority of their funding from the territorial government, and the remainder from municipal taxes. In 2011–12 there were 49 schools in the NWT, with 8,509 students enrolled and over 800 teachers. This represents approximately a 13 per cent decrease from 2003–04, when enrollment was 9,727 students. The NWT has developed its own curriculum for kindergarten through to grade 9. The curricula for senior secondary grades follow that of Alberta, although the NWT has developed its own curricula for additional northern high school courses. The territorial Department of Education, Culture and Employment has worked to make education an interactive process involving students, families and communities in the school system. Two aboriginal curricula, DeneKede and Inuuqatigiit, bring the Dene and Inuit perspective to schools in the Western and Eastern Arctic. Aboriginal language specialist teachers and an increasing number of aboriginal teachers trained through community-based teacher education programs play an active role in ensuring local language and culture is integrated into school programs. The establishment of a community-based college system has contributed to local priorities being reflected in adult and continuing education. Arctic College was established in 1984 with campuses in Fort Smith and Iqaluit, and grew rapidly to include campuses in each region of the NWT. In 1986, the Arctic Colleges Act established the college as a corporate entity at arm's length from the territorial government and gave it the mandate to deliver adult and post-secondary education. By 1987, it was agreed that community learning centres across the North would join the college system, a process which was completed in 1990. In 1995, Arctic College was divided into two colleges: Aurora College in the Western Arctic; and Nunavut Arctic College in the Eastern Arctic. The establishment of these colleges is part of an overall strategy to strengthen adult and post-secondary education across the North. The two colleges provide an increased focus on community needs. Aboriginal peoples in the NWT have strong interests in maintaining their cultures and preserving their heritage. Aboriginal cultural institutes have been established in several communities, and many others have initiated programs to record the knowledge of elders, to teach children traditional skills and to maintain their languages. Music and art festivals are becoming increasingly popular in many parts of the NWT. Many community museums, historical societies and heritage groups operate within the NWT. The Arctic Winter Games, held every two years since 1970, include a variety of traditional games as well as more widely known sports, drawing competitors from the NWT, Yukon, Nunavut, Alaska and northern Alberta. Six weekly newspapers are published regularly in the NWT and a general publisher is located in Yellowknife. In 1958 the CBC established a Northern Service to meet the special needs of northerners. Radio broadcasts are made in 10 Aboriginal languages and dialects, as well as in English and French, and include local community as well as network programs. Satellite technology makes it possible to transmit radio and television programs into the most remote northern communities. A wide variety of public and private telecommunication services are available across the NWT. CBC North's CFYK-TV is broadcast out of Yellowknife. Telephone, cellular and Internet services link nearly all communities. Active archaeological surveys are providing greater knowledge about the early native peoples in the Subarctic and the Arctic. Each year new archaeological discoveries are made which provide greater knowledge about the early native peoples in the Subarctic and the Arctic. Many historic sites are associated with the fur trade in the Subarctic, and with exploration for the Northwest Passage and the lost Franklin expedition. These sites are now protected by law against vandalism and looting. T. R. Berger, Northern Frontier, Northern Homeland (1976); L.-E. Hamelin, Canadian Nordicity: It's Your North, Too (1979); D.H. Pimlott et al, eds, Arctic Alternatives (1973); K.J. Rea, The Political Economy of the Canadian North (1968); W.C. Wonders, ed, The North (1972); M. Zaslow, The Opening of the Canadian North, 1870-1914 (1971), and ed, A Century of Canada's Arctic Islands, 1880-1980 (1981). YellowknifeThe City of Yellowknife website. Northwest TerritoriesThe website for the Government of the Northwest Territories.